I’m noticing a trend in my Monday’s lately: I develop or at least become aware of certain pet-peeves that I posses. I have a lot of pet-peeves. I’ve made a list before and it seems to only be growing as I spend more and more time in the work world. Monday’s have a way of turning little annoyances into astronomical problems , at least to my sleep-deprived brain. So today a woman brought to light an annoyance of mine that really gets me going. In my office I have a little picture of my nephew by my computer. The woman, we’ll call her “Sally”, said to me “that isn’t your baby, is it??? I knew where this was going. “No, he is my nephew” I replied. “Oh, good” Sally said with a sigh of relief. I could have let it go, I maybe should have let it go, but I didn’t. A. What if it WERE my child. You have just seriously offended me and insinuated that I am irresponsible and stupid because I have had a child before I was… supposed to? B. What age is the “right age” to have a child? Why do so many women think that they know that magic age and have the right to judge other mothers if they don’t meet that criteria? Sure, having a child young has its own set of complications, but it also has a lot of benefits! Guess what? You WON’T be the mom that goes to your child’s elementary school and all of his or her friends ask “why did you bring your grandma to parent’s day?” This actually happened A LOT when I was in school. I felt so bad for little Jenny whose parents looked like they should leave parent’s day and go immediately to hospice care. You know what is more exhausting than chasing around a 3-year old when you are 24? Chasing around a 3-year old when you are 44. Guess whose body recovers faster after pushing a child out? It’s not the woman who is only a few years away from menopause, I’ll tell you that. I’ve spent all afternoon kicking myself because I didn’t respond to Sally with “You have a 25-year old daughter? You look WAY TOO OLD to have a daughter that age.” Next time, next time. 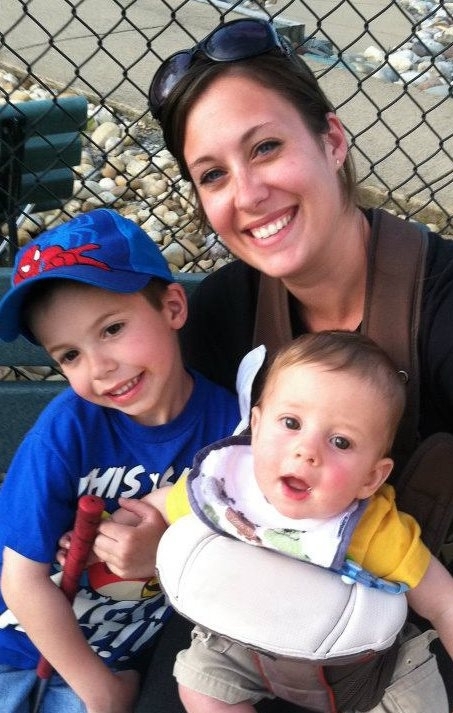 Here is my friend with her gorgeous boys. Too bad she is “too young to have kids” because her oldest son is one of the sweetest, most well behaved, most cared for, politest little boy’s I’ve ever met. This made me tear up! Thank you so much for posting this! I have gotten slightly less agitated at the just plain rude comments people have made to me over the years. While I was pregnant with Kaiden I lost track of how many people asked me if my kids had the same dad. Not a good thing to say to a terribly hormonal pregnant woman. I used to always want to tell people “I bet my kid is WAY better bahaved and mannered than yours.” LOL people do need to mind their own business and not all of us “young moms” are train-wreck tramps. I’m exhausted and I’m 24! Can’t imagine if I was 44!! Of course my love! I think about you all the time when people say stuff like this to me. Drives me crazy. Yeah, agreed! Just by people asking that shows how assuming they are. All young moms MUST be getting knocked up by several different men, right? Crazy! You BOTH are great moms! Thanks for being inspirations and role models for the rest of us! I used to run into this a lot since I had Brian at 22. Never mind that my husband was 7 years older than me, there was lots of judgments and stares. There are way too many ignorant people in this world. I thank God every day that I did have him that young cause if I had waited, he wouldn’t be here. He is a blessing. And I agree with you wholeheartedly, Tristan is a sweetheart (but then again – so is his family 🙂 ) Just ignore that silly woman — she isn’t worth the time. That’s a very good point, Heather! He was supposed to be created at the exact moment he was. Who are we, as humans, to judge God’s timing? You are absolutely right about people being so quick to judge when it comes to kids. I used to get the nastiest looks from strangers when I was 16 and my little brother was 4. They obviously thought he was mine! Court this is an awesome post! It is something that I deal with all the time and I had Nick at almost 21. I mean it’s annoying. Just last week in Zumba I brought nick to stay and play and she was like oh your brother is so cute, so I said thank u but he is my son and I got the dirtiest look and a condescending OH. And I don’t like being told my life is over. I mean really I live my son to death, am able to keep up with him and still working on my PhD I think it is far from over. I honestly don’t think it is anyones business I mean as long as the child is taken care of people should keep their rude comments to themselves! So glad you liked it Jenn, I can’t imagine how much crap you have had to put up with!! Why wouldn’t people look at your son and think “wow he looks so happy and healthy, that young and beautiful mom is somethin’ else!” So many negative and judgmental people out there. Also, I think it’s very odd that someone would assume Nick is your brother!! Umm THAT to me is weirder than thinking he is your child haha. You are so inspiring with how much you’ve been able to accomplish after having a baby. Who knows, maybe you wouldn’t have come this far if you HADN’T had Nick. I think kids push their parents to go further and accomplish more. You keep doing what your doing girl, you’re awesome! Chin up girl, “Sally” will probably get kicked out of the hospital because of saying something stupid to her daughter! Love you!! It’s amazing isn’t it? You could probably write pages and pages about the ignorant comments that have been made towards you and Grant. I completely agree with you about being mature enough to have kids. Some 40 year olds are WAY less mature than some 20 year olds I know. It’s not always about the number. And wow 33 and 71, that’s wild! I’m sure they are both super happy with their relationship though and couldn’t imagine it any other way. Hopefully! I dropped all thoughts of Sally from my mind after writing this post. She is not worth my time. Instead it made me want to look into ways to help and support young moms. I’m sure there are ways to donate time, money, and items to young mothers in need in the area. I’ll let you know what I find! Ugh yeah that would have pissed me off too. I can just picture your face, it was probably the same as mine earlier today! Doesn’t the general public know the wrath that Courtney and Christina can bring down?! It’s not pretty.